Early travelers to the Midwest found the park-like nature of the oak savannas enchanting. Modern travelers are equally enthralled by the savanna. The openness of the savanna landscape, the ancient open-grown oaks, the wide vistas, the colors of the grasses and forbs, are often remarked upon. Whereas an oak woodland is pleasing for a few weeks in April and May when the spring ephemerals are in bloom, an oak savanna is delightful all year. 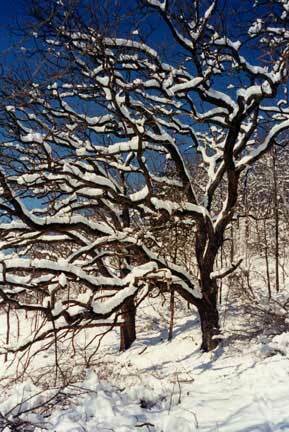 Even in winter a snow-covered open-grown oak is an exciting object. Open space is a widely sought commodity, and open-space values are engrained into American society. However, open space has more than just aesthetic value. There are economic values of open space that are widely recognized such as: water quality protection; flood control; maintenance of ground water quality; improvement of air quality, etc. Restored oak savannas contribute to all these ecosystem services. Open space lands can provide important habitat for plant and animal species whose habitat areas are decreasing due to conversion of land to residential use. Open lands provide opportunities for learning more about our natural surroundings and developing a greater sense of wonder and awe about the world and humanity’s place in it. The oak savanna is a rare historic landscape. Just as historic buildings can be restored, so can oak savannas. There are important educational values in demonstrating to schools and the public these restored landscapes. There are also important connections of the savanna to the presettlement lives of Native Americans. Response to fire Well-spaced trees reduce the probability of crown fires. Historic data show that presettlement fires were mostly ground fires, but because of fire suppression they are now more likely to be crown fires. Historic oaks Throughout the eastern United States, very large oaks are cherished for their beauty and longevity. Aesthetic qualities include the varied vistas, bringing wildlife up close, seeing some of the great trees, enjoying the understory vegetation. 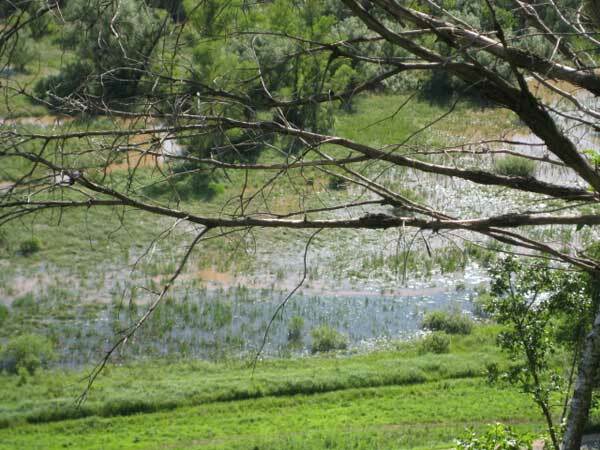 Photo illustrating the effect of a savanna restoration on the clarity of flood water. A major rain event flooded the whole valley. The flood water in the foreground came from the restored savanna (note its clarity), whereas all the rest of the water came from unrestored nearby hills (note its muddiness). Probably the most significant utility of the oak savanna is for recreation. Natural lands are a valuable recreational resource for such nonimpact activities as hiking, photography, ski touring, hunting, bird watching, etc. Although a restored savanna can remain as a private sanctuary, public access is recommended. Without public immersion into the savanna via hiking trails, people will be unaware of the uniqueness of the savanna. Only through public knowledge of these priceless landscapes can their long-term futures be assured. Hiking trails can be provided with very little impact on the savanna ecosystem. No new trails need to be made. The service road(s) used to move cut wood can be turned into excellent hiking trails. Fire breaks can serve as supplementary trails. Trail markers can be modest so that they do not detract from the natural beauty. These simple trails will bring visitors into the heart of the savanna. 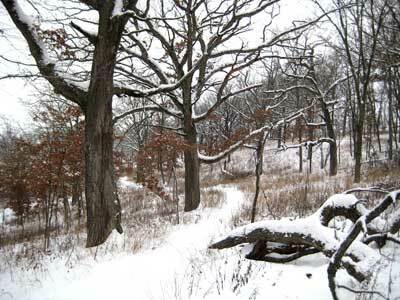 A fire break through a white oak savanna makes an excellent hiking trail for the public. Photographers and photography should be encouraged. There are numerous photo sharing web sites such as Flickr, Shutterfly, SmugMug, PBase, PhotoBucket, PrintRoom, and Fotki on which savanna photos can be featured. Photographers may also be willing to lend images for an oak savanna web site or a local photo exhibit. Videography should also be encouraged, and videos of savannas made available on web sites such as YouTube. The savanna can provide simple pleasures for families with small children. A family hike is an excellent afternoon entertainment. Scout groups, 4-H groups, and family groups should be encouraged, and given the opportunity to volunteer for seed collecting and planting. School children can carry out classroom projects with parents, teachers, or adult naturalists. 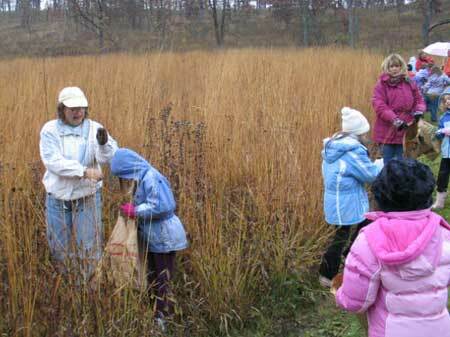 Group of Girl Scouts and their parents collecting seeds at a Conservancy. Scout groups are often looking for volunteer projects in the outdoors, and seed collecting is an excellent activity. 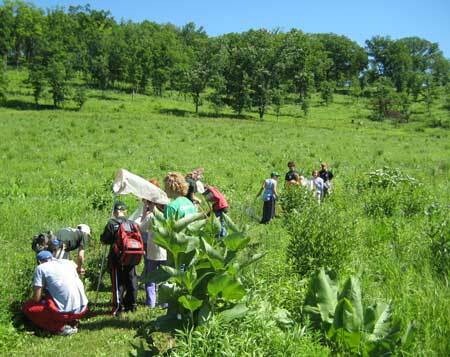 A Summer Science Camp from a local middle school studying insects that thrive in a prairie and oak savanna area. Education is an important goal of oak savanna restoration. School and university class trips, classroom projects, summer projects, and research activities are some of the ways the oak savanna mission can be spread more widely. 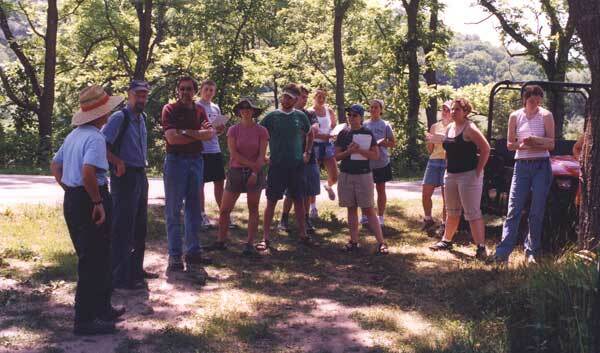 A Plant Ecology class from a nearby University learning about oak savanna characteristics and restoration. 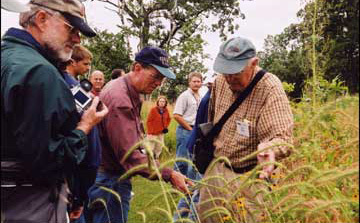 Field trip from the 2004 North American Prairie Conference learning about the development of savanna grasses in an oak savanna restoration. 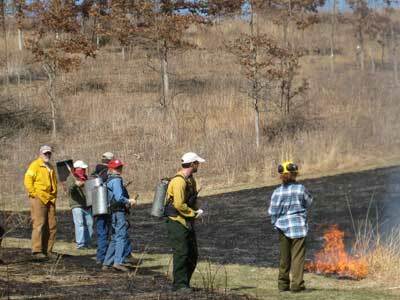 A burn school from the Aldo Leopold Foundation carrying out test burns adjacent to a white oak savanna. Where can oak savannas be established? Most of the degraded oak savannas are probably on private lands. Landowners with the resources can create their own savannas, for their own enjoyment, as private hunting grounds, or with access to the public. The Wildlife Habitat Incentives Program (WHIP) is a voluntary program for people who want to develop and improve wildlife habitat primarily on private land. One of the priority areas in this program is oak savanna. Through WHIP USDA's Natural Resources Conservation Service provides both technical assistance and up to 75 percent cost-share assistance to establish and improve fish and wildlife habitat. WHIP agreements between NRCS and the participant generally last from 5 to 10 years from the date the agreement is signed. A ½ to 1 acre parcel in a residential backyard may also be a restorable savanna if it has a few open-grown oaks. Such a restored backyard provides a major enhancement to the property, with possible long-term financial benefits. Because of the large amount of tree removal, restoring an oak savanna is not cheap. However, it can be done in small stages as resources become available. The open-grown oaks that are present have been on the property for a long time, and should remain an even longer time. “Daylighting” these oaks is virtually guaranteed to extend their lives, so that restoration can be looked upon as a long-term investment. 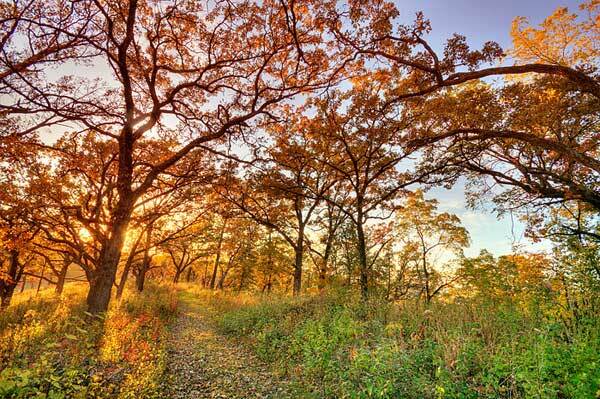 The cost for restoring an oak savanna will vary widely. Much depends on the quality of the site, the topography, ease of access, wage rate in the area, and how much of the work can be done by the landowner and volunteers. Calculations for a fairly large restoration on heavily degraded land in southwestern Wisconsin amounted to $3000 to $6000 per acre (2014 values). This was for a project where none of the wood was sold, although virtually all of it was made available to local residents for fire wood. Although there is no tax deduction when wood is donated to locals, the restoration project should benefit from good will. Long-term management costs should be one-fifth to one-tenth the initial restoration costs. The principal cost of long-term management is for prescribed burning.